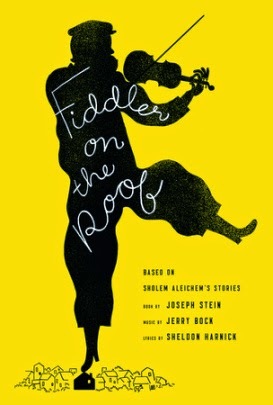 Fiddler on the Roof was reissued in book format (Crown Publishers) in 2014 in honor of the 50th anniversary of the Broadway play. The play, based on Sholem Aleichem's stories, has a book by Joseph Stein, music by Jerry Bock, and lyrics by Sheldon Harnick. Fiddler on the Roof tells the story of Tevye and his family, living in Anatevka, Russia, in 1905. Tevye delivers milk in the village. He has a sharp-tongued wife, Golde, and five daughters. The three oldest daughters are young women who are interested in romance and matrimony, although they have ambivalent feelings about matchmaking. This is seen in the song "Matchmaker, Matchmaker." The town matchmaker suggests that Tevye's oldest daughter, Tzeitel, should marry the village butcher, Lazar. Tzeitel has other ideas about this match, since she is in love with a tailor that she has known since childhood, Motel. After Tzeitel finds her match, her sister Hodel falls in love with a young man who is political named Perchik, a tutor to the girls in the family. Then sister Chava falls in love with Fyedka, a young man who is not Jewish. Each romance takes the family further from the tradition they grew up with. As the play moves on, there is more political unrest, and Jews are being forced to leave their homes and villages. As Tevye's family prepares to move, a fiddler plays a song. Life with family and love and traditions will go on, but it will be different. I grew up in a family that loved musicals - both movies and plays. I have heard the soundtrack to this play many times and enjoyed the 1971 movie starring Chaim Topol, but I had never read the play. I really enjoyed reading the lyrics to the songs I grew up listening to and reading the story with its humor, warmth, and gravity. I heartily recommend this play to anyone who loves theater. I am sure that I will enjoy rereading it again in the future. Wow, 50 years! When I was a teenager I used to check out books from the library that were Broadway plays in print and really enjoyed reading the lyrics to the songs. My husband and I saw Fiddler on the Roof at a dinner theater many, many years ago. I need to listen to the sound track again. It's been too long. I used to do the same exact thing as a teenager. I loved the collections of Broadway plays, and checked them out from the library over and over again. I have not seen the movie of Fiddler on the Roof in a long while, and I just put it on hold at the library. I remember really liking it in the past!